While things here at Hive HQ seem to move at breakneck speed, we still carve out time for reflection. We thought we’d join the rest of the world by greeting the New Year with a Top 10 list. So Chris, Leah and I fired up our trusty Etherpad-fueled way-back machine and made two lists—a two-CD gift set, if you will. One list looks at our top achievements and highlights from 2012, while the other list—bonus tracks!—does some trend-spotting based on some things begun last year that are informing our plans for 2013. We would also love to hear your top Hive NYC moments in the comment section below! 2. Summer Code Party > We hosted seven parties last summer—big/small, upstate/downstate, inside/outside—with youth and adults, learning and making side by side. 3. Hive Street Squad > Zainab, Wilson and Eddie, our three high-school summer interns, came to us with little to no experience with HTML and CSS, and left as true webmakers.They created their own Thimble projects, shared their new-found expertise with their peers, and were instrumental in helping us pull off our Summer Code Party events. Thank you MOUSE and NYSCI for keeping Hive NYC youth moving across the city and through the network. 5. State of the Hive > In June, we had our first-ever mandatory meet-up. We wanted to ensure we had all member stakeholders together to recap where we’d been and discuss where we’re headed as a network. Many of the ideas discussed are being and tested in our learning lab right now—such as the Hive NYC Youth Council. The frank and fruitful discussions shaped Hive HQ’s thinking and planning helping us to roadmap the year going forward. We also kicked off our 3x3x3 project share-outs—a process that involves responding to three questions using three slides in a three-minute time slot. This was a quick mechanism to provide members yet another opportunity to share and learn best practices and hard-won lessons from the best source possible—one another. 8. Hive at TFI Interactive > We were thrilled to be asked to moderate a panel at this prestigious conference dedicated to inspiring content creators. Chris Lawrence of Hive NYC, along with Jess Klein (Mozilla) and Marc Lesser (MOUSE) discussed the intersection of coding and education, the 4th R, and the importance of teaching the next generation how to program instead of being programmed. 9. 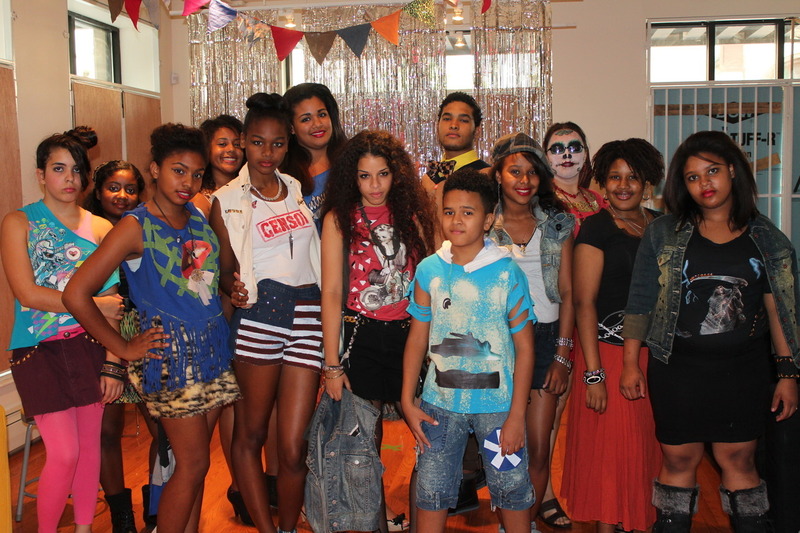 Youth Events > From Emoti-Con! and Digital Waves to Harold Hunter Day and Maker Faire, it is always a thrill for Hive NYC to be a part of events that are geared towards teens, and in many cases, conceived and planned by teens as well. These events all provided opportunities for youth across Hive NYC to showcase their work, share skills with their peers, meet with and receive critiques from industry professionals, learn new skills, have fun and get (H)activated by what Hive NYC has to offer. From creating prototypes of devices that help the visually-impaired and documenting skateboard culture across the city to making Tibetan mandalas and modding T-shirts, Hive youth ruled in 2012. 10. MozFest > In November, we witnessed the culmination of many of our 2012 efforts at Mozilla’s annual festival, held at Ravensbourne in London. Hive Pop-ups Around the World > In 2012, there was notable growth in interest in starting new Hive Learning Networks as close as Toronto and as far as Tokyo. The Hive Pop-Up is one way to test the water, to see if and how a learning network might foster collaborations among interested parties within an urban area. Last year, they popped-up in Athens, Berlin, San Francisco, Toronto, Tokyo and Waterloo. Hive HQ has had a great time participating in some of these events and we’re excited to feel the burgeoning momentum and promise that these events embody. This year that may triple. Silent Conference Calls + Etherpad = Productivity > For those who are unfamiliar, Etherpad is an open source, online, collaborative, real-time editor, and we use it A LOT, oftentimes in conjunction with conference calls. More than once, we’ve taken a verbal break on a community call to allow for 5-10-minutes for focused, free-flow of information entered on an Etherpad. It is amazing what we can accomplish when we all shut-up and work! Expect many silent calls going forward. Rise of Hive Youth Tumblrs > Many members started using Tumblr to document their programs this year and we’re digging it. Some of them learned how to trick out their own theme at our first Summer Code Party, a partnership with Tumblr where we featured the Customize your Tumblr Webmaker project. We created this list of Hive NYC youth Tumblrs so you can track the progress, insight and outcomes of some of our teen programs. One aspect of this that excites us is how easy it is for these project Tumblrs to follow and reblog each other’s work. Could this be a tool in helping cross-connect our youth and projects? Or will some other hot micro-blogging or social media project take its place? Transformation of Hive Member Meet-ups > Every month, approximately 30-40 Hive NYC members come together for our in-person meet-ups. After a brief summer hiatus, we decided to evolve these meetings to a more network-focused and Hive NYC-sourced events. We wanted Hive HQ to do less agenda setting and create more opportunities for members to lead professional development workshops, activities or discussions. This way, we all get to experience how each member approaches their programs, how they facilitate activities, what they learn and gain and how they aim to make them better. We are Mozillians with a “less yak, more hack” ethos—so we’re still thinking about ways to mix up this format and keep it new. Hive NYC Members Assemble (Cocktail/Mocktail Editions!) > We have plenty of opportunities throughout the year to work with each other, and to learn from and with one another. But in 2012 we peppered in a few occasions to just socialize and get to know each other better. We took over a bar in San Francisco to gather for happy hour during MacArthur’s Digital Media and Learning Conference DML12 in March. We celebrated summer on a rooftop in Brooklyn (yet another happy hour). We hosted our holiday party at Eyebeam and had it catered by Chef Bascom at The POINT to make it a true Hive family affair. In all cases we had a great time but most importantly, no pictures to prove it. Where are we meeting up next? Will we continue to have too much fun to live tweet or document the experience? Hive NYC Members Make, Share and Learn > Hive NYC brought it in 2012 and all signs point to more and better game in 2013. This blog in particular became a space where members and Hive youth shared their experiences and project outcomes. While we’ll be expanding the website to feature more about Hive NYC, its member organizations and collaborations in 2013, we will continue the multi-vocal nature of the Explore + Create + Share blog. Thanks so much to our members, partners, colleagues and friends for making 2012 so epic! From Hive NYC StoryCamp, game jams, and more awesome project collaborations and events, there’s a lot on the horizon for 2013—stay tuned!